Illinois has the worst personal income growth in the U.S.
Lawmakers’ proposed new and higher taxes would only make things harder for struggling Illinoisans. 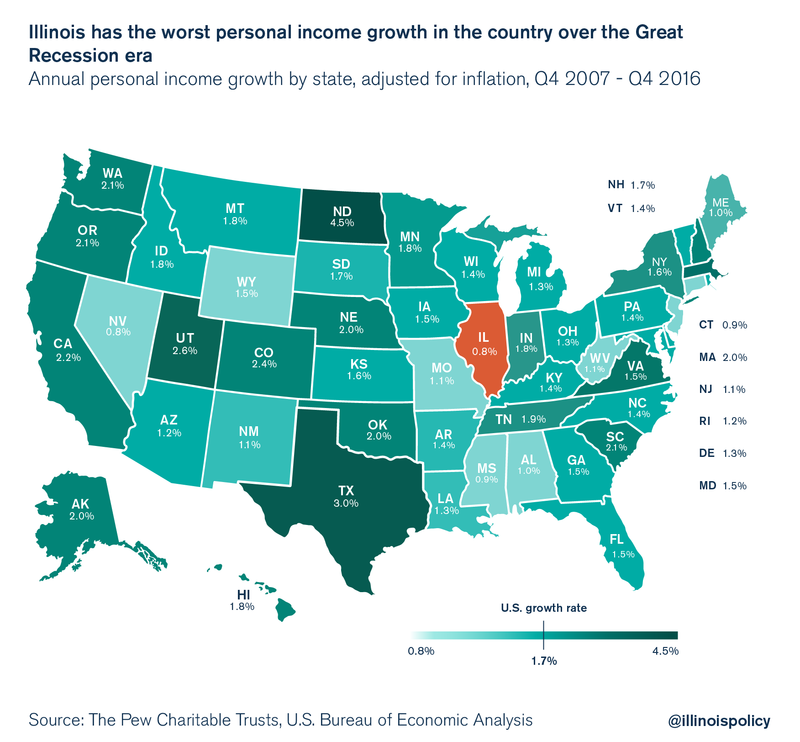 Illinois is home to the worst personal income growth in the United States over the Great Recession era, and tax hike proposals in the Illinois General Assembly would only make this worse. Illinoisans have experienced income growth of only 0.8 percent per year from the end of 2007 to the end of 2016. This leaves Illinois tied with Nevada and behind even low-growth states such as Mississippi and Connecticut. An exodus of income-earning power from the state has accompanied Illinoisans’ flat paychecks and the state’s years of slow economic growth. Hundreds of thousands of Illinois income-earners have been leaving the Land of Lincoln in search of better opportunities in other states. While Illinoisans have seen anemic personal income growth over the last nine years, the average U.S. state has doubled Illinois’ income growth rate, and neighboring Indiana has done even better than that. Hoosier income has grown 1.8 percent per year, compared to 0.8 percent in Illinois. This economic data might come as a surprise to anyone paying attention to the tax debate in Illinois, where state and local taxing authorities have treated Illinois taxpayers like a bottomless well of new revenue. Since the Great Recession ended, for example, large increases in local property taxes and sales taxes have battered the average Chicago taxpayer. And across the state, Illinois taxpayers saw their income taxes rise to 5 percent from 3 percent between 2011 and 2014. In May, Illinois Senate Democrats passed $5.4 billion in new and higher taxes, which would take an additional $1,125 from each Illinois household every year, on average. But the taxpayer well is drying up. Illinoisans are struggling with weak income growth more than any other state population in the country. Rather than looking to take still more money from taxpayers, political leaders should be working to prevent further tax increases from swallowing up more of Illinoisans’ weak income growth. These economic facts are reflected in recent public polling that shows Illinoisans are sick of taxes. A May Illinois Policy Institute-commissioned poll revealed that 64 percent of Illinoisans surveyed oppose income tax increases to balance the state budget. After two years of a painful budget impasse, Illinoisans still overwhelmingly oppose a tax hike to solve the problem. And recent polling from the Paul Simon Public Policy Institute found that the majority of working-age Illinoisans would prefer to leave the state, and taxes are the No. 1 reason. Public polling and economic data provide very clear guideposts for Illinois lawmakers: Pass a balanced budget and don’t raise taxes to do it. The Illinois Policy Institute has proposed a budget plan to do exactly that. Lawmakers and other interests groups should follow suit and write a budget without a tax increase so that the next budget deal will be a “grand bargain” for taxpayers instead of another insider deal for the political class.